For the Salman Ahmad album, see Infiniti (album). Not to be confused with ɛ̃fini or Infinity. Infiniti (インフィニティ, Infiniti, IPA: [iɰ̃ɸiniti]) is the luxury vehicle division of Japanese automaker Nissan. Infiniti officially started selling vehicles on November 8, 1989, in North America. The marketing network for Infiniti-branded vehicles includes dealers in over 50 countries. In 2012, Infiniti moved its global headquarters from the Nissan corporate building in Yokohama and incorporated in Hong Kong as Infiniti Global Limited, with Carlos Ghosn intending for Infiniti to have a greater focus on the burgeoning luxury market in mainland China as it forecast the country to become the largest luxury car market. Nissan appointed Roland Krüger, former head of BMW's Asian division, as president of Infiniti in September 2014. With its QX60 crossover (formerly known as JX35) Infiniti began to produce vehicles outside Japan. In 2014, it started producing two models in Xiangyang, China, a plant operated by Nissan's joint venture with Dongfeng Motor. At the same time Nissan Motor Manufacturing UK expanded in Sunderland, England, to produce a new compact car named Q30 in 2015. The Infiniti marque is not used in Japan. However, the Infiniti Q50 is sold as a Nissan Skyline in Japan and retains Infiniti badging, though without the Infiniti brand or name. Most Infiniti models have direct equivalents in the Japanese domestic market Nissan lineup. Examples include the Infiniti G as the Nissan Skyline sedan and coupe and previously the Nissan Primera, Infiniti M as the Nissan Fuga and previously the Nissan Leopard, Infiniti EX as the Nissan Skyline crossover, and the Infiniti Q45 as the Nissan Cima. The Infiniti FX has no Nissan equivalent and is not sold in Japan. The Infiniti brand was introduced in the United States in 1989. The marketing strategy was to target the premium vehicle segments in the United States that would not have otherwise fit in with Nissan's more mainstream image, and partially influenced by the Plaza Accord of 1985. The brand was created around the same time as Japanese rivals Toyota and Honda developed their Lexus and Acura premium brands. The Japanese government imposed voluntary export restraints for the U.S. market, so it was more profitable for automakers to export more expensive cars to the U.S. 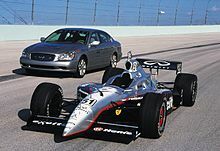 The Infiniti marque was launched with two models, the Q45, and the M30 that were previously sold at Japanese Nissan Motor Store dealership networks. The Q45 was based on the all new second generation JDM Nissan President on a five millimeter shorter wheelbase platform at 2,875 mm (113.2 in). Starting with model year 1992, the wheelbase matched the President's wheelbase at 2880 mm (113.4 in). The Q45 included a 278 hp (207 kW; 282 PS) V8 engine, four wheel steering, and active suspension system offered on the first generation Q45t. The car's features would have made it competitive in the full-sized "luxury" segment against the Mercedes S-Class, BMW 7 Series, Jaguar XJ and Cadillac Fleetwood. A second model was introduced in November 1989, the 2-door M30, a badge engineered Nissan Leopard. It remained in production for three years as an alternative to the Lexus SC. The powertrain was the VG30E 162 hp (121 kW; 164 PS) engine and an automatic transmission. The M30 coupe was underpowered for its stock weight of 3,333 lb (1,512 kg). The M30 convertible weighed even more, due to the required body and chassis reinforcements. The appearance of the M30 had almost no resemblance to the larger Q45, and the interior was almost completely different. Infiniti did not offer a mid-luxury sedan to match the first Japanese luxury sedan introduced to North America, the Acura Legend, which was later joined by the Lexus GS. Infiniti's first offering in the entry-level luxury segment was the Infiniti J30, which had to compete with the revised 1992 Lexus ES and was unsuccessful owing to its small interior and unusual styling to which it was succeeded in 1996 by the Infiniti I series introduced previously in April 1995, related to the Nissan Maxima and in 2002 by the Infiniti G35. According to the company, the Infiniti badge has a double meaning, as stylized representations of both a road extending into the horizon and of Mount Fuji, reflecting its Japanese origins. In September 1990, Infiniti introduced a third model, the Infiniti G20, derived from the compact and European-focused Nissan Primera. In 1992 for the 1993 model year, Infiniti introduced a four-door coupé J30 with only one engine option, the 210 hp (157 kW; 213 PS) VG30DE. This engine was from the 222 hp (166 kW; 225 PS)300ZX, the JDM Nissan Cedric, Nissan Gloria and the Nissan Cima, and was the North American version of the third generation JDM Nissan Leopard. Infiniti sales were slow. The company's initial campaign aimed to bring about brand awareness with Zen-influenced spots that focused on nature and tranquility, without showing the actual cars. Designers decided not to adorn the interiors with wood accents and chrome brightwork, opting instead for a monochrome, organic and rounded surface appearance, focusing on padded leather and vinyl throughout. Some buyers had faux wood appliques added to areas surrounding the center console and around the interior door handles. The only item that had a bright appearance was the centrally installed analog clock in all models, a design that is currently maintained by the designers. By the mid-1990s, Infiniti was lagging behind Lexus and Acura in sales. The Q45 had retreated considerably from its focused, taut rendition of a sporty full-size luxury sedan, having become a barely recognizable, ponderously handling sedan that earned the nickname "The Japanese Lincoln". In the summer of 1998, Infiniti revived the G20, based on the JDM Nissan Primera, a compact sport sedan. The second generation G20 was marketed as a competitor to European entry-level luxury sport sedans, but it now weighed more than the first generation version. Because Infiniti continued to use the SR20DE four-cylinder engine and compact size, it fell short of sales expectations. The G20 was also marketed primarily to the wrong demographic, that being middle-aged professional women, and as such it was not as popular new as its main competition, the similarly priced Acura Integra. In late 1996, Infiniti released the QX4, modifying and adding premium accommodations to the Nissan Pathfinder, becoming one of the first luxury car manufacturers to offer a mid-size premium SUV. Infiniti replaced the J30 mid-sized rear drive sedan with the second-generation JDM Nissan Cefiro, giving it the North American designation "I30" in 1996. It offered one engine, the 193 PS (142 kW; 190 hp) VQ30DE with front wheel drive shared with the Maxima. The I30 was redesigned for the 2000 model year, featuring an increase in power to 231 PS (170 kW; 227 hp). Infiniti made further changes to the I30's appearance and performance in mid-2001, upgrading the engine to the more powerful 259 PS (190 kW; 255 hp) VQ35DE; this inspired a name change to the vehicle, which became the I35. Sales and the brand, bereft of an image or a following, floundered. By 2000, large Japanese companies were feeling the effect of the Japanese asset price bubble, and the reduced desirability of Infiniti's led to its facing extinction. The company rededicated itself to developing a dynamic and powerful line-up of sporty luxury cars. This coincided with parent company Nissan entering into an alliance with Renault under the direction of Carlos Ghosn and the Nissan Revival Plan. Car and Driver reported that Infiniti executives invited members of the motoring press to a meeting where they "swore never again to take their eyes off BMW." Although this effort began with a completely redesigned Q45 flagship for the 2002 model year in early 2001, it was the G35 that helped improve Infiniti sales by 2003. In Japan, Nissan had a well established reputation with premium level performance sedans after Nissan acquired the Prince Motor Company and integrated the Nissan Skyline, Nissan Laurel and Nissan Gloria, originally Prince vehicles, in 1966–1968. A sports sedan replacing its Nissan Primera-based predecessor (the G20), the Nissan Skyline-based Infiniti G35, was successful after it was voted Motor Trend Car of the Year in 2003. Nissan Motors President and CEO, Carlos Ghosn, developed a business strategy to break Infiniti away from its Nissan roots. The G series helped re-define Infiniti as the "Japanese BMW", as it was aimed directly at the BMW 3 Series of sedans and coupes. The M35/M45 garnered acclaim from the automotive press, winning an eight-car comparison test in Car and Driver, and the model was named the best luxury sedan by Consumer Reports. The M45 model featured the same engine as the Q45, and the M45 became the flagship model after the Q45 was discontinued. The Infiniti M (2002–2005) and the Infiniti G (starting in 2002) were known in Japan as the Nissan Gloria and the Nissan Skyline. In November 2006 for the 2007 model year a redesigned version of the G35 sedan was launched, followed in August 2007 by a new version of the company's G coupe, the G37. The coupe was first unveiled at the New York International Auto Show in April 2007. Also released in (December) 2007 was new Infiniti EX35 compact crossover, Infiniti's entry into the compact luxury crossover market. The EX shared the G35's 3.5-liter, 306 hp (228 kW), V6 engine. Carlos Ghosn unveiled Infiniti's arrival in Europe at the Geneva Motor Show 2008. The official launch was late 2008, and was phased over a two-year period across 21 European countries. Four models are offered in Europe: the next generation of the Infiniti FX37 and Infiniti FX50 performance SUV, the Infiniti G37, the Infiniti G37 coupe, and the Infiniti EX37 crossover. Infiniti Europe's headquarters are in Rolle, Switzerland. Johan de Nysschen was appointed to head the Infiniti division in 2012. De Nysschen left the company as of August 2014 to become CEO of Cadillac. Infiniti Chairman Andy Palmer assumed de Nysschen's responsibilities. Nissan appointed Roland Krüger, former head of BMW's Asian division, as president of Infiniti after the chairman of the marque, Andy Palmer, resigned to join Aston Martin in September 2014. In 2019, Infiniti announced that the brand will be leaving the Western European market. This is due to a combination of poor sales, tough competition from European luxury brands (primarily Mercedes-Benz, BMW, and Audi), and the uncertain Brexit outcome. Inifini will instead focus on the U.S. and Chinese markets where most of the brand's sales come from. The QX30 and Q30 produced at the Nissan factory in Sunderland will cease production. Nissan announced the return of front-wheel drive to the Infiniti lineup on August 30, 2011 with the release of the Infiniti JX. It will join Toyota's Lexus brand in terms of blending front-wheel drive and rear-wheel drive vehicles again; since its inception in 1989, Lexus has had front-wheel drive platforms underpinning entry-level vehicles like the Lexus ES and Lexus RX. More importantly, the JX was meant to give Infiniti a credible rival to the Acura MDX and BMW X5 crossovers that offer optional three-row seating. Infiniti's former model name designation included one letter for coupés and sedans (two letters for SUVs) and a number reflecting engine displacement. For example, the QX56 was an SUV featuring a 5.6 L engine. An exception to this was the QX4 SUV, which featured a 3.3 L engine (1996–2000) and later a 3.5 L engine (2000–2003). An "x" following the engine displacement of Infiniti sedans denoted an all wheel drive model (e.g. Infiniti G35x), "s" denoted a sport package, "h" denoted a hybrid model, "d" denoted a diesel model (e.g. M30d) and a "t" for a Touring model (older models only). INFINITI entered Formula One in 2011 as a sponsor of Red Bull Racing  to generate brand awareness in its quest for geographical expansion. The choice of the team was driven by the already existing collaboration with the Renault-Nissan Alliance: Renault Sport Racing was the engine supplier to Red Bull Racing. In 2011, INFINITI also signed Formula 1 World Champion Sebastian Vettel as its first global ambassador. The establishment of Renault F1® Team in 2016 by the Renault-Nissan-Mitsubishi alliance partner provided INFINITI with the opportunity to evolve its involvement in Formula One, leveraging its expertise in hybrids and contributing engineering resources to Renault F1® Team and to become a technical partner in the sport. The partnership extends the already highly successful industrial synergy of the Alliance. Leveraging its expertise in hybrids, INFINITI contributes engineering resources to Renault F1® Team for the co-development of the Power Unit’s Energy Recovery System (ERS), one of the most sophisticated technologies in motorsport. INFINITI’s expertise is being used by Renault F1® Team at their powertrain R&D facilities in Viry-Châtillon (France), with a team of INFINITI hybrid specialists relocating there from the INFINITI’s technical center in Atsugi (Japan) to work with the team on the ERS. From the 2017 season, Renault F1® Team’s racecars feature an ERS co-developed with INFINITI. The hybrid set-up incorporates two motor generator units and a battery for energy generation, energy capture, and energy deployment when most needed for a performance boost. INFINITI brings an international diversity of young, fresh-thinking engineering talent to Renault F1® Team through its highly successful INFINITI Engineering Academy. 2019 will be the sixth edition of this global recruitment program that offers engineering students from all over the world a once-in-a-lifetime opportunity to join a unique automotive and motorsport placement, thanks to the technical partnership and strong collaboration between INFINITI Motor Company and Renault F1® Team. A key pillar of the INFINITI Engineering Academy is exploring crossover opportunities and the sharing of technology between INFINITI and Renault F1® Team projects. Project Black S is a collaborative venture between INFINITI and its Renault-Nissan-Mitsubishi partner, Renault F1® Team. This ground-breaking project celebrates the relationship between the two companies and explores the potential for a new INFINITI performance grade, featuring unique-for-the-road technology inspired by Formula One. Suggesting a radical reinterpretation of the INFINITI Q60 coupé, the performance hybrid powertrain being explored through the INFINITI Project Black S prototype features an Energy Recovery System (ERS) inspired by the dual-hybrid system proven in Formula One which technology does not yet exist in a current road car. ^ Infiniti. "About Us - Infiniti Media Website". infinitipress.eu. Retrieved 2017-05-09. ^ a b c d Philip, Siddharth (January 14, 2014). "Nissan's Infiniti Says Joint Daimler Platform Is Planned". Bloomberg. Archived from the original on 2 February 2014. Retrieved 31 January 2014. ^ "Infiniti water commercial". Youtube. Retrieved 2 February 2017. ^ "Infiniti Launch Commercial". Youtube. Retrieved 2 February 2017. ^ "Infiniti releases first image of sleek, seductive Q30 Concept". Fit4Talent.com. Fit4Talent. 28 August 2013. Retrieved 28 August 2013. ^ "Infiniti announces new Head of Public Relations". Fit4Talent.com. Fit4Talent. 17 August 2013. Retrieved 17 August 2013. ^ Tisshaw, Mark (12 March 2019). "Infiniti pulls out of Europe". Autocar. Retrieved 12 April 2019. ^ Pattni, Vijay (12 March 2019). "Infiniti is leaving Western Europe". Topgear. Retrieved 12 April 2019. ^ Shirouzu, Norihiko (12 March 2019). "Infiniti is leaving Western Europe". Reuters. Retrieved 12 April 2019. ^ "The most disliked cars of 2011". CNN. Archived from the original on 2012-04-26. ^ "Infiniti Canada sales figures". Yahoo.com. Archived from the original on 2015-12-08. Retrieved 2015-11-30. ^ Oldham, Scott (August 1996). "Asia Spy Report". Popular Mechanics. 8. 173: 27. Retrieved 27 August 2010. ^ RainMeister (14 June 2002). "IRL: Nissan Withdraws". freshalloy com. Archived from the original on 11 July 2011. Retrieved 27 August 2010. ^ Alex Brownsell. [campaignlive.co.uk/article/infiniti-secures-f1-red-bull-team-tie-up/1057485 "Infiniti secures F1 Red Bull team tie-up"] Check |url= value (help). Campaign. Retrieved 1 March 2011. ^ Andrew Benson. [news.bbc.co.uk/sport1/hi/motorsport/formula_one/9409120.stm "Red Bull get budget boost through Infiniti link-up"] Check |url= value (help). BBC Sport. Retrieved 1 March 2011. ^ [renaultsport.com/Renault-launches-comprehensive-Motorsport-programme.html?r=331 "Renault launches comprehensive Motorsport programme"] Check |url= value (help). Renault Sport Racing. Retrieved 3 February 2016. ^ [infiniti.com/pursuing-potential/infiniti-f1.html "INFINITI and Renault F1™ Team"] Check |url= value (help). INFINITI Motor Company Ltd.
^ [renaultsport.com/One-Season-In.html?r=331 "One Season In"] Check |url= value (help). Renault Sport Racing. Retrieved 15 December 2016. ^ Christian Sylt. [forbes.com/sites/csylt/2016/10/12/why-two-maufacturers-are-better-than-one-in-f1/#3772fa3b4573 "Why Two Manufacturers Are Better Than One In F1"] Check |url= value (help). Forbes. Retrieved 12 October 2016. ^ a b [youtube.com/watch?v=GdLMMeE1H_U "INFINITI High Performance Hybrid Technology for the Road and the Track"] Check |url= value (help). INFINITI Motor Company Ltd. Retrieved 21 March 2016. ^ [infiniti.com/pursuing-potential/infiniti-engineering-academy.html "INFINITI Engineering Academy"] Check |url= value (help). INFINITI Motor Company Ltd.
^ [renaultsport.com/infiniti-launches-2018-engineering-academy-with-renault-sport-formula-one-team.html?r=331 "INFINITI launches 2018 Engineering Academy"] Check |url= value (help). Renault Sport Racing. Retrieved 6 March 2018. ^ [infiniti.com/headlines/project-black-s.html "Project Black S"] Check |url= value (help). INFINITI Motor Company Ltd.
^ Vijay Pattni. [topgear.com/car-news/paris-motor-show/infinitis-project-black-s-563bhp-q60-f1-tech "Infiniti's Project Black S is a 563bhp Q60 with F1 tech"] Check |url= value (help). Top Gear. Retrieved 1 October 2018.